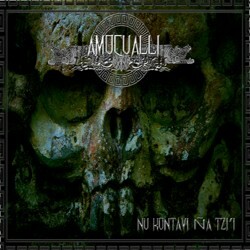 Mexican pre-Hispanic folk black metallers Amocualli are back with their second full-length album “Nu Kontavi Ña Tzi“. Amocualli come from Tuxpan, Jalisco and were initially formed in 2005 as a solo project. After a quite long break for several years, they managed to get a complete line-up in 2012 and it was only last year that they released their debut full-length work “Tlayoualotl“. The band has been very active since then and in the summer of 2014 their new album was out via Kukulkan Records. Like in their first work, Amocualli continue to explore Jalisco traditional music and legends, combined with metal. The overall music style and sound quality remain pretty much the same with the debut album. They have a very personal character, where raw underground metal is mixed with native music of equally raw nature. They use many pre-Hispanic local traditional instruments, mostly wind instruments and percussion. These instruments are very dominant in their sound, creating a unique exotic atmosphere that transfers you instantly in the rainforests and the ancient tribes that lived there. Unlike most folk metal bands, where usually the traditional tunes is the most melodic element of their music, in Amocualli’s case things are quite different, since their local folk music is far from being melodic, at least for what my ears are used to. It has a very ritualistic approach, like an effort to convert nature sounds into music and it works perfectly in terms of atmosphere. The metal orchestrations of the band move between various genres, from epic metal and melodic black metal to raw extreme black metal. Their guitars are once again the most melodic element of their music. Riffs, melodic leads and wonderful solos are very technical and in my opinion there is an imbalance with the raw unedited production level, which somehow flattens their sound. Vocals are in the brutal side, with various types of screams, growls and grunts, closer to the raw aesthetic of Jalisco folk music. There are also many “ambient” parts with nature sounds and distant folk instruments, enriching even more the dark atmosphere of “Nu Kontavi Ña Tzi“. Their lyrics are written once again in their local ancient dialects, dealing of course with relevant themes. While their first album impressed me very much, since it came out of nowhere with a very distinct and personal sound, this new work convinces me that Amocualli is a band that is here to stay; something that raises my expectations even more. They seem to take seriously what they do and their task is very difficult, since they try to mix a quite raw primitive traditional music with the much more modern sound of metal. In my opinion they need more work in the production and overall sound balance. Either way I totally recommend “Nu Kontavi Ña Tzi” to all those who like to listen to a different type of folk metal, influenced by ancient Mexican music. It is released in a jewel case edition CD, with 8-page booklet including all the lyrics. You can visit the band’s official Facebook profile below for more info and watch the official video for “Cipactli” to get a more complete idea of their music.